Geetanjali Institute of Technical Studies and Pyrotech signed the Memorandum of Understanding (MOU) on 10th January 2019 to provide training to the GITS Students, Udaipur. This Ceremony was organized at CSE Seminar Hall, GITS Campus. 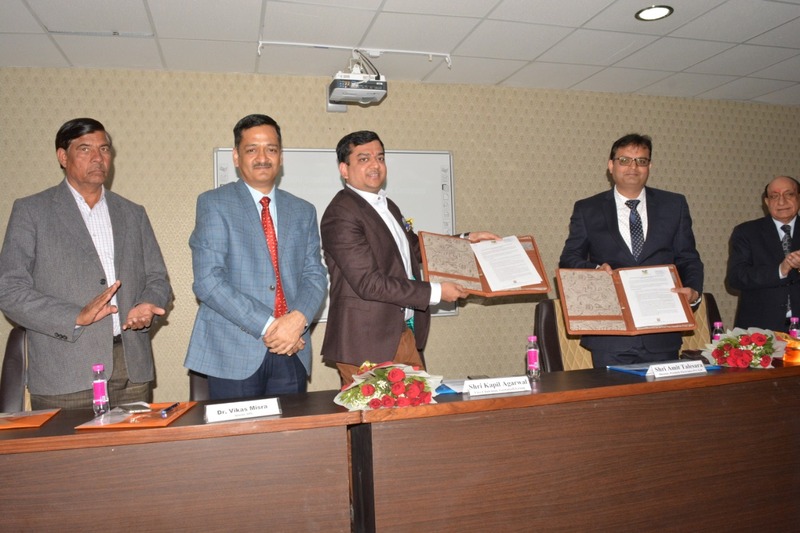 The MOU Ceremony commenced with the ritual of lamp lightning by the Chief Guest Mr. Amit Talesara, Director – Pyrotech and Mr. Kapil Agrawal, Vice Chairman Geetanjali group. The idea of collaboration was mooted after meetings between top officials of both organisations. They saw value in enhancing authentic training for students who will form the future workforce. On this Occasion, Dr. Vikas Mishra, Director GITS conveyed that Pyrotech Electronics Pvt. Ltd. is a manufacturer and supplier of Control Room Equipment, Electronic Process Control Instruments, LED Drivers and LED Displays, for last four decades for Power Plants, Process Plants and other Industries. Mr. Kapil Agrawal, Vice Chairman Geetanjali group congratulates GITS for this milestone. He also conveyed that GITS has become a brand in the fields of academics by providing opportunities for employment and entrepreneurship to students. Our institution has created a niche in the world of technical innovations and has progressed step by step consolidating its position with the latest industry trends and methods. Mr. Amit Talesara, Director – Pyrotech conveyed that in order to help students we have to engage them in Industrial projects and assessments to develop these skills. He stated that they will select 15 Top Students from the Second Year of Electrical & Mechanical Engineering and trained them according to the industrial Requirements. Mr. Arvind Singh Pemawat, Head Training and Placement brief about this MOU ceremony. after this Mr. M K Sharma, Advisor HR Pyrotech brief brief about the company as well as their productions and Manufacturing Plants. Dr. P K Jain, Director MBA GITS conveyed that Over the past decade, companies across industries have digitized their operations and processes. Even now, businesses are employing artificial intelligence to streamline workflows. As a result, today’s Students require specialized skills to help them stand out from the crowd. Through these type of Industry Institute partnership our Students got skills and Industrial Exposure. Vote of Thanks was given by Dr. Deepak Paliwal, Head Mechanical Engineering and anchoring was done by Ms Anjali Dhabhai. Company Officials Mr. Amit Talesara (Director - Pyrotech) and Mr. M K Sharma (Advisor HR Pyrotech), Dr. P.K Jain (Director MBA, GITS), Dr. P. C. Bapna (Vice Principal, GITS), Mr. B L Jangir (GITS Finance Controller), HODs and Faculty member of GITS were present.